Note from Al: As of October 1, 2008 we elected to suspend our Duffy dealership. However we remain enthusiastic about electric boating and plan to continue to maintain our website to promote electric boating in general. We may choose to resume a dealership operation in the future. In the meantime, if you have any e-boat questions, feel free to contact me. I remain very connected to the industry. "Electric boating offers reliability, efficiency, simplicity, comfort, atmosphere, tranquility - the whole experience with NO hassles - and friendly to our environment. It is, without a doubt, pleasure cruising at its finest." -- Al Hartley, Owner, Four Seasons Electric Boats, Lake Gaston. 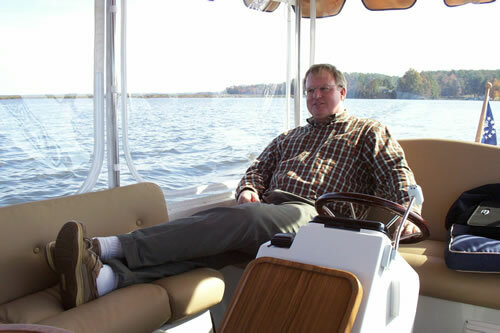 A word from Al Hartley, : I've talked to a lot of folks about electric boating since we opened our electric boat business on Lake Gaston in 2003. A common reaction is that this is a great "new concept" or misconceptions that electric boats don't have power or longevity. While electric boats are not new, there has been a revival over the passed few decades - for great reasons. After much research and analysis, we selected Duffy electric [inboard] boats for our initial dealership and continue to be enthusiastic about the product line although we have elected to suspend our dealership operation (as of Oct 1, 2008). So spend your money on gas for your fast boat for water sports and then enjoy the wonders of electric cruising for your slow boat. 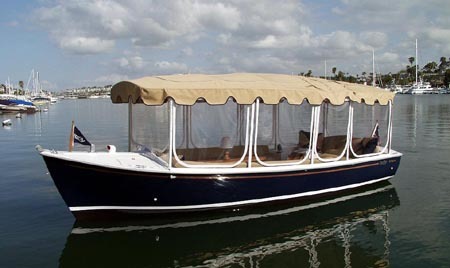 My personal favorite is the Duffy 21 Cruiser -- especially for off-season enjoyment and particularly after a fresh snow! Hopefully you'll find the information on this page enlightening and perhaps an opening to boating possibilities you've not considered. If you have additional questions or curiosities that aren't addressed here, please give me a call or send me email. I love to talk about electric boats! If you have time, take a look at our short Duffy cruising video. Click here for a printer-friendly PDF version of this primer. It requires Adobe Acrobat Reader which can be downloaded for free from this location. Electric boats are definitely not a new concept. What is believed to be the very first marine outboard motor was invented in 1880 by a French inventor, Gustave Trouve, and it was electric. In the early 1890's electric boats were first introduced in the United State with the formation of the Electric Launch Company (Elco) in Bayonne, New Jersey. It was the Chicago Exposition in 1893 that put them on the map. Elco was requested to build fifty-five (55) 36-foot electric launches for this event. Ticket sales to transport people around the Chicago area lakes and rivers exceeded 1,000,000. That was over 120 years ago and at that time electric motors were the preferred form of propulsion. The electric "Picnic Launch" became the essence of a perfect lake cruise. Elco's company records reveal that Thomas Edison, John Jacob Astor, Admiral Dewey, George Westinghouse, and the Grand Duke Alexander of Russia were all owners of Elco electric launches. There were, of course, steam engines that were very powerful, yet heavy, a lot of work and not conducive to a pleasant cruising experience - especially when their boilers would explode. In the late 1800s, there were also gasoline engines. These engines at that time were called "Explosion Engines". The names were later changed to "Gasoline Engines" to make them sound safer, and more appealing to the consumer. After about 1920, gasoline and diesel engines became the primary propulsion units for boats - but they could never offer the quality of the electric cruising experience. At that time, electric boats lost their following, because the batteries could not carry enough energy to match the horsepower of the internal combustion engine - as folks became more intrigued with speed at the expense of comfort and quality of the boating experience. However the Navy's submarines continued to rely heavily on electric propulsion - because it is fundamentally reliable, efficient, and quiet. Later on, Navy ships and commercial vessels returned to electric propulsion systems for the same reasons - but using generators to create the electricity.Today, the Queen Mary II is powered exclusively with electric motors that generate 157,000 horsepower. So electric propulsion is not a "new concept" and is considered by far the most reliable form of propulsion. Not only is electric propulsion reliable and efficient, it offers the ultimate pleasure boating experience: relaxing, quiet, and NO smelly fumes. For these reasons combined with the advances in battery technology, electric pleasure boating has enjoyed a revival over the passed few decades. 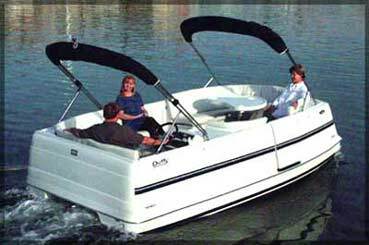 Several companies, including Duffy Electric Boats, considered the industry leader of this revival since 1970, have resurrected the electric launch and other more contemporary designs. Electric boating has become the boating lifestyle of choice for many thousands around the world in many different venues for the mainstream population. What's So Special About Electric Boats? Imagine a boat that starts every time - with no mechanical headaches - as EASY as a golf cart to operate. You just unplug, untie, turn the key, and go. Duffy electric boats are so reliable that they come with a lifetime warranty of the electric propulsion system. And did I mention NO GAS? Have you checked those prices lately? Plus, there's the added benefit of NO POLLUTION. Imagine a RELAXING sunset cruise with NO NOISE, listening to music, conversation, and laughter of your family and friends - instead of the noise of a motor. Imagine a scenic cruise after a fresh snow in a cozy heated cabin. 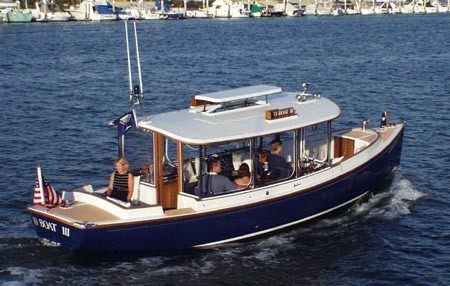 The elegance, design, and proven reliablity of the Duffy boats in particular are what really got my attention - they are beautiful reproductions of the electric launch as shown in this photo of the Duffy 21 and the Herreshoff steamer as shown in this Duffy 30: they offer 19th century luxury with 21st century technology. The most common misconception that I hear is that people are afraid that they will run out of electricity. To that, I always answer with a question, "Do you frequently run out of gas in your car?" Most people respond, "Never." It is the same in a quality electric boat. Duffy boats, for example, have an electronic hour meter that tells you how many hours and minutes you have left on a digital readout on the console. I've gone from one end of Lake Gaston to the other and most of the tributaries in between with no worries. These boats are designed to run all day on a charge and recharge overnight - for about $1's worth of electricity! Another common concern that I hear is that people aren't sure whether or not electric boats will be able to stand up to a tidal shift or a strong current. The simple answer is, yes. I can qualify that by comparing the Duffy Drive System, which turns a 15-inch by 15-inch propeller at 1100 RPM's. That is more like a tugboat and we're definitely not talking about trolling motors. 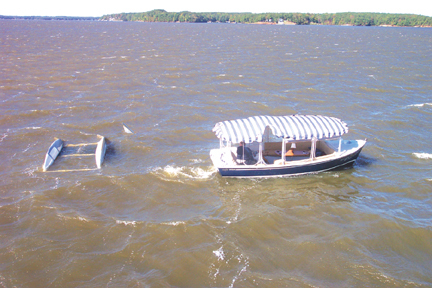 I have personally towed at least 2 dozen broken down power boats on Lake Gaston with my Duffy 21 Cruiser - including the rescue of an overturned catamaran sail boat in 40 mph winds and very turbulent water. But then again, we are not talking about speed here. Electric boating is about the journey - not the destination - a rather amazing journey, at that. This is not your ski boat - it's your slow pleasure cruising boat at its finest. Optimal cruising speed is about 5 mph - in comfort and style. Another question we hear, "If I'm out in one of these boats, how will I out run a lightning storm?" The answer to that is, "You don't need to." Duffy electric launches are fully enclosed, all-weather boats equipped with heaters, windows and a Sunbrella roof. (Enclosure is also available for the Cat 16.) So you are protected from rain, wind, sleet, snow - you name it. Lightning really isn't an issue either. Even though they say not to be on a body of water during a lightning storm, the lightning is more likely to hit something high up, like a tree or power lines. Just like everything else, apply common sense to weather conditions, find a protected location and stay put until the storm passes. In over 2000 hours of electric boating in the last year and a half, I've only been unable to return to my dock once before a storm hit. I simply pulled into a cove, shut the windows, listened to a nice CD, and let the storm blow over. Total cost of ownership is significantly less for electric boats than traditional gas-powered boats as reflected in this cost comparison table. Let's compare a 21-foot pontoon boat with a 50 horsepower engine to a Duffy 16 Catamaran (similar to a deck or pontoon layout and seats 10 adults comfortably). This comparison will be for an 8 year period with a 16-week boating season at 24 hours a week. The pontoon boat has a base price of $21,000 average and will burn about 18,.000 gallons of gasoline and use about 40 gallons of oil. That is about $60,000 of operating expense. Small outboards typically last about 1500 hours with proper maintenance. The engine will need replacing twice at a cost of about $15,000. This is a total of $96,000. The Duffy 16 Catamaran has a base price of $25,195 (2006 MSRP), will consume about $65 worth of electricity during this time period, and the batteries will be replaced once at a cost of around $500. All Duffy boats have a lifetime warranty on the power system, so if a component fails - it gets replaced free of charge. The total price would be $25,760. This comparison does not take into account the additional cost of winterizing the pontoon boat. 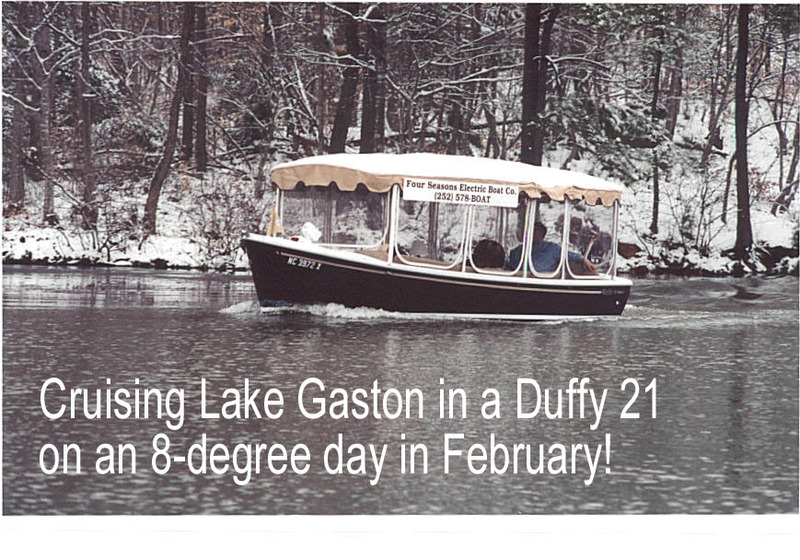 The Duffy boat can remain ready to use year-round. We've really enjoyed winter cruises - especially after (even during!) a fresh snow. Maybe new to Lake Gaston and this region but definitely not a new concept - instead a proven, mainstream reality. But perhaps it is a new mindset - more akin to sailing without the work. When you go sailing - it's not about the destination - it's about the sailing experience. Duffy Electric Boat Company has been manufacturing their boats since 1970 and is considered the leader in the electric boating revival that has been in progress for a few decades. There are thousands of Duffy boat owners worldwide. Several other manufacturers have also followed suit. While we have selected the Duffy product line with a large-scale manufacturing facility in California, along with Ray Electric Outboards of Florida (great for pontoon conversions), two very fine electric boat manufacturers are right here in North Carolina: Budsin Woodcraft and Black River Boats. They make custom-designed crafts that are truly works of art. The Electric Boat Association of America website is a great reference site. So spend your money on gas for your fast boat for water sports and then enjoy the wonders of electric cruising for your slow boat. And at the same time make a real difference in keeping our lake water clean - there are no pollutants released into the water. In comparison, 2-stroke engines release up to 30% of their fuel/oil mixture into the water; 4-strokes are better at a 15% maximum rate. Electric boating offers reliability, efficiency, simplicity, comfort, atmosphere, tranquility - the whole experience with NO hassles - and friendly to our environment. It is, without a doubt, pleasure cruising at its finest. (c) Copyright 2004 - 2011 Four Seasons Electric Boat Company. All Rights Reserved.